KANSAS CITY, MO — The No. 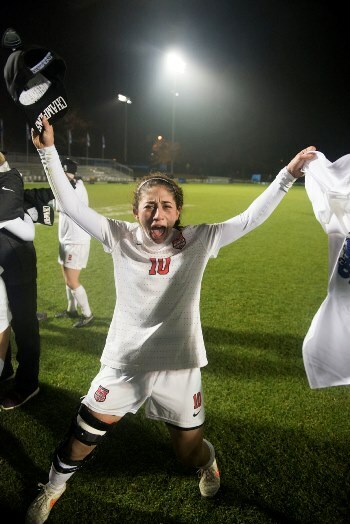 1-ranked University of Lynchburg women’s soccer team won the first team national championship in school history Dec. 6, knocking in four penalty kicks to Williams College’s three after ending double overtime scoreless. Head Coach Todd Olsen was subsequently named the Divison III National Women’s Soccer Coach of the Year. Dr. Olsen led the Hornets to the 2014 DIII National Championship title with a 27-0-1 mark which matched a national record for wins in a season and broke the Old Dominion Athletic Conference (ODAC) record for wins, shutouts, consecutive shutouts, goals scored and points recorded in a season. Senior Angela Bosco was named the Division III National Player of the Year after being named a first-team All-American. Samantha Bagherpour ’17 also made College history by winning the school’s first ELITE 89 award at the NCAA Division III Soccer Championship banquet. To see more articles, videos and photos, check out Championship Central. Lynchburg took the ball to start the match and got it deep into Williams territory before the Ephs turned the tide on the Hornets, charging up the field with Audrey Thomas carrying the ball on foot. Thomas was all alone at one point but Natalie Deacon was able to catch her in the box, forcing a pass. The sophomore found Kristi Kirsche who took a shot that banged off the crossbar where Tess Frelick snagged the deflection. Lynchburg had a great opportunity to score 20 minutes into the match as Dessi Dupuy took a shot that was saved by Hannah van Wetter. The Hornets retained possession and Angela Bosco took a rip 55 seconds later that was also saved by van Wetter. The first half was evenly played, but the second half started with the Hornets facing a lot of Williams pressure despite an early chance. Lynchburg looked to get on the board early in the half as Dupuy maneuvered around a defender and got in the box. Too close to the end line to have a good shooting angle, the forward sent it across the box, but could not find a fellow Hornet before Williams cleared it. That play set Williams up to turn the field, which the Ephs did thanks to the footwork and strength of their forwards. The Hornets cranked up the intensity after that point, making it tough for Williams to clear the ball out of the Lynchburg offensive zone. With 33 minutes left, Lynchburg took advantage of the Williams struggle, taking the ball away and clearing a shot for Marina Clark. Clark let loose from 30 yards out, but the ball cleared the goal five feet above the crossbar. Williams continued to struggle with the Lynchburg offense as Dupuy had another chance three minutes later. The senior got van Wetter out of position, but Alison Magruder cleared it off the line to preserve the scoreless tie. Both defenses locked down from that point on, as there would be one shot in the next 20 minutes as Frelick saved a ball from Kirshe at 62:46. The Hornets still maintained possession for much of the half after that point, getting a shot at 11:22 as Jenn Snyder found Kelley Smith beyond the top of the box. The sophomore had a great chance, but similar to Clark’s attempt, it went just high. That shot got the Hornet crowd into the match even more than they were previously, shaking the stands as Clark took a corner at 9:55. Her kick was punched out by van Wetter, but two minutes later another corner was awarded as Daisy Thomas clearned the ball off the Williams defender. Williams could not clear that corner though as Lynchburg maintained possession, getting a shot from Dana Nelsen that floated towards the goal, but came to rest on top of the netting. Both teams had opportunities in the overtime periods, but Williams appeared fatigued, spoiling several chances and allowing Lynchburg to turn the field. The Hornets were held scoreless in both sessions despite two great shots by Smith in double overtime. Her first missed the top left corner by mere inches. The second was saved by van Wetter to set up the penalty kicks. Williams and Lynchburg exchanged goals in the first round as Mai Mitsuyama scored to Frelick’s right before Smith went finesse to get past van Wetter. The Hornets took advantage in the second round as Jacqueline Simeone missed and Clark connected. Lynchburg’s Maxwell and Bagherpour scored to win it for the Hornets. 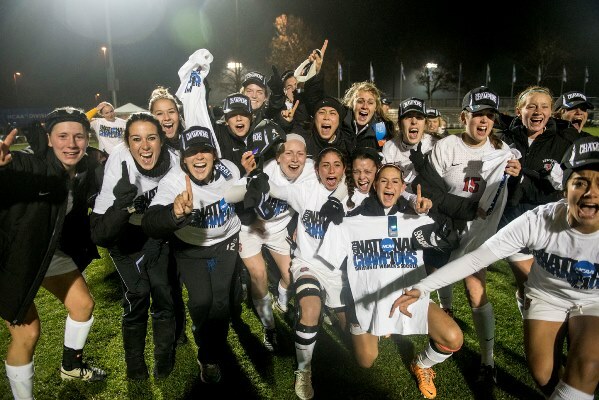 The win matches a national record for wins in a season and the program broke the Old Dominion Athletic Conference (ODAC) record for wins, shutouts, consecutive shutouts, goals scored and points recorded in a season.